Management accounting around the world 2.20 The History of Management Accounting in France, Italy, Portugal, and Spain (Carmona); 2.21 Management Accounting Practices in the People's Republic of China (Chow, Duh & Xiao); 2.22 The Development of Cost and Management Accounting in Britain (Boyns & Edwards); 2.23 Management Accounting Theory and Practice in German-speaking Countries (Ewert & Wagenhofer); 2.24 The history of Management Accounting in the US (Fleischman & Tyson); 2.25 Development of Cost and Management Accounting Ideas in the Nordic Countries (Nasi & Rohde); 2.26 A history of Japanese Mangement Accounting (Okano & Suzuki). 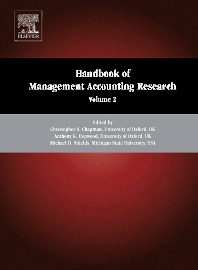 Volume two of the Handbooks of Management Accounting Research consists of two groups of chapters. The first draw together research that has focussed on particular management accounting practices. The second set synthesise contributions to the literature that have been focussed within particular organisational contexts. Volume two concludes with a review of research on how management accounting practice and research varies around the world. Special pricing available if purchased as a set with Volume 1.